Unique and enhanced formulation with glycolic and lactic acid designed to therapeutically prime and lighten skin. This product combines essential and the most effective formulation that primarily acts as a skin lightener and an anti-aging agent. 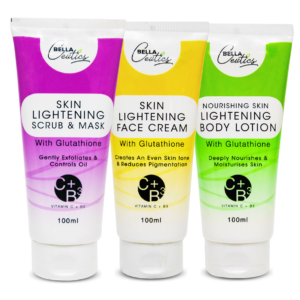 Independent use or in combination with other lightening products have added benefits including skin rejuvenation, combat the effects of sun exposure and damage, anti-aging (wrinkles and fine line ablation and youthful skin restoration), desloughing agent ( for oily or acne prone skin and scarification) and skin lightening. Application is topical and not limited to the face. Apply twice weekly, only at night. Apply directly to a cleaned and toned face, gently even out the application until the lotion disappears. As a facial mask – apply liberally over the face and retain for 2-3 hours prior to rinsing off. The benefits of this include a reduction in the oiliness of the skin and treatment of clogged pores resulting in healthier, even toned and a brighter appearance. Aloe Barbadensis, Glycolic acid, Lactic acid , Kojic acid and Berry extract.